When you ship full truckloads, using a private or dedicated fleet eliminates one major burden: searching for capacity. But you'll still contend with most of the usual transportation challenges, including supply chain impatience. Customers want their products fast, and they want them on time. They also want to know where their freight is, and often what condition it's in—or, at least, to be notified right away when anything about a shipment diverges from plan. Visibility breeds confidence in the supply chain. "There is an increased expectation around transparency, and the speed of information," says Gary Allen, vice president of supply chain excellence at Miami-based Ryder, whose dedicated transportation division employs more than 7,000 drivers in North America. Technologies for monitoring shipments and delivering that information to customers continue to evolve, providing new opportunities to improve efficiency and service. One company enjoying the benefits of those technologies is Wayne Farms in Oakwood, Georgia. Wayne Farms ships fresh poultry to food processors, and both fresh and prepared chicken products to a variety of customers, including food service distributors, restaurant chains, and retail stores. In two regions—Northern Alabama and Georgia, and Southern Alabama—Wayne Farms relies on dedicated fleets provided by Penske Logistics. Those trucks move full truckloads of fresh product from the company's deboning plants in the region to its two processing plants, and deliver fresh and prepared products to customers. Once they place those orders, most customers expect to receive their product the next day. "They want that truck to deliver in the morning, so they can get the product on their trucks and deliver to customers a few hours later," says Ken Esser, director, inventory and logistics at Wayne Farms. Wayne Farms relies on Penske not only to supply trucks and drivers for those deliveries, but also to manage the moves. Penske's dispatch management system generates routes and calculates an estimated time of arrival for each delivery. "We also have three systems on Wayne Farms' equipment to give us visibility," says Tom Scollard, vice president, dedicated contract carriage at Penske, based in Reading, Pennsylvania. The first is an onboard trailer tracking system, which monitors the location of each refrigerated trailer and the temperature inside. "I can see the unit temperature and validate the product quality," Esser says. Trailer tracking is important because the Wayne Farms fleet includes three times as many trailers as tractors. Most of its deliveries are "drop and hook"—the driver disconnects from the trailer as it's delivered and picks up another. That means a full trailer could spend many hours in a yard, waiting to be unloaded. "Knowing what's going on with those trailers is vital," Esser says. The second piece of technology is Penske's proprietary in-cab mobile communications system, which lets drivers and dispatchers exchange information and provides GPS tracking data. The third piece is an onboard computer, which includes an electronic logging device (ELD) to track the driver's hours of service. That computer also monitors vehicle performance and driver behavior. Penske transmits this information to Esser. Wayne Farms' end customers don't keep an eye on the trucks themselves. But they depend on Esser to make sure their shipments are on track and to notify them early if anything goes wrong. "Customer service goes a long way if we can tell them their truck will be late, before they call to ask where it is," Esser says. Penske recently developed Route Status to deliver shipment information to mobile devices. Esser uses the system to track crucial loads after hours, and shipments that might be affected by bad weather. Visibility is also crucial to companies that use dedicated fleet services from Averitt Express. Those customers fall largely into two groups—automotive manufacturers that rely on Averitt to deliver components from suppliers to assembly plants, and retail chains that use Averitt to move product from distribution centers to their stores. Speed is especially important to Averitt's automotive customers, including Nissan, Mercedes-Benz, and BMW, because their shipments support just-in-time manufacturing. An assembly line could come to a halt for lack of the right parts at the right time. "We've got to do a great job in our processes and keep the customers informed about where we are with each route," says Brandon Fox, driver services and technology leader at Averitt Express in Cookeville, Tennessee. Some trucks shuttle back and forth all day between one supplier and an assembly plant; others visit several providers before delivering a full trailer to the manufacturer. Averitt's retail customers include Dollar General, Shoe Carnival, Cracker Barrel, Petco, and PetSmart. Some companies put their own logos on the dedicated trailers; others prefer trailers that carry the Averitt brand. While the need for speed among retail shippers isn't quite as urgent as it is among auto manufacturers, retailers do need accurate ETAs. "They need to have the people in place to receive the product at their store locations," Fox says. A missed ETA, with no warning about the change, could leave the company paying employees to stand around waiting rather than working. Customers in both industries require visibility into their shipments. Most get this by implementing a visibility platform from a vendor such as FourKites, MacroPoint, or 10-4 Systems. Averitt uses application programming interfaces (APIs) to feed the necessary data into customer systems. Shipment status data comes from two sources. The Omnitracs system installed in Averitt's cabs provides real-time and historical vehicle positions, while Averitt's dispatching system provides details such as tractor number and route name. "Some customers want just the Omnitracs position data, some want just the dispatch data, and some want both," Fox says. By comparing position data to planned ETAs, customers get early warning about shipments that might arrive late, letting them make the necessary arrangements—for example, rescheduling the personnel who are assigned to unload the truck. To give shippers further insight into factors that might affect the ETA, these platforms can overlay real-time traffic data and weather forecasts, Fox says. Ryder provides dedicated trucking to a broad range of customers in industries such as retail, consumer packaged goods (CPG), automotive, industrials, and metals. Besides providing trucks and drivers and managing the shipments, the company offers value-added services in disciplines such as engineering and continuous improvement. Those services focus, for instance, on how to route more efficiently. Consider a truck delivering inventory for a retail customer, making eight to 10 stops on every trip. "Our engineering team looks at how to continually improve fuel usage and service time and, importantly, drive down costs while still meeting delivery requirements," Allen says. Among its customers, especially in CPG and retail, Ryder has recently heard requests for more frequent deliveries, with fewer units of each product on the truck. "They want their product faster, but they want the right amount when they need it," Allen says. Shippers also want to know where the truck is and when it will arrive. "They want a proactive ETA that's pushed to their cell phones, as an example," he says. Technologies are evolving to meet that demand. To improve visibility, Ryder has introduced a platform called RyderShare that merges data pulled from multiple sources. "Customers have visibility to where their product is at any time, delivered on an app, on any device they want," Allen says. Besides providing an ETA, the service lets the customer know what's on the truck and the product's condition. "But the value is more than just visibility to the trucks," Allen adds. "It's managing the data, providing analytics and insights to let customers know if and why something goes wrong." Ryder obtains most of this data from telematics systems on the trucks, which provide GPS locations plus data about engine and driver performance. The company also installs a camera in each cab to capture video if an accident occurs. "We proactively push this information to our customers, or our customers' customers, depending on how they want to provide that visibility," Allen says. 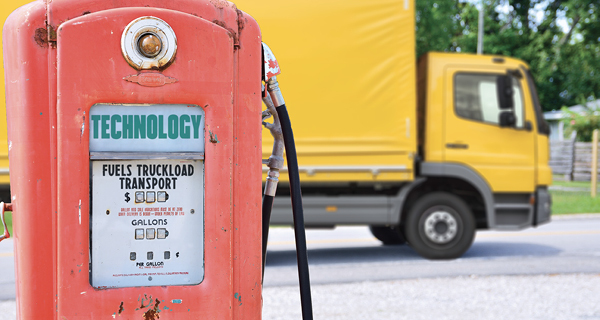 For customers that use refrigerated trailers, Ryder can capture data from temperature sensors. It can also install sensors that measure how much space remains on a loaded trailer, providing opportunities to add more freight. As crucial as technology has become to running efficient truckload transportation, it doesn't operate in a vacuum. "If you don't have the people to support it and help get the job done, technology alone won't do it," Esser says. The individuals who dispatch Wayne Farms' dedicated fleet are crucial to the operation. "They come up with ideas," he says. "But they also tell me if there's a problem before I see one. We can better solve problems that way."